The realm of the possible and impossible seem to grey when you ride the escalator up and enter the doors of E3. Taking a quick glimpse back, all you can see are smiles as fellow gamers slowly make their way up. As I walked through the glass doors strewn with advertisements of games I love, my eyes became fixed on what laid before me. Square Enix’s booth shined bright. Music from Afrojack blared as I moved closer to the game I was waiting to see. My fear from the previous day’s conference slowly faded and I finally decided to take the dive. First up I had to play Final Fantasy XII: The Zodiac Age. To you Final Fantasy fans, you understand. I had to get a taste of that time-based but active feel before I attempted to try the new action platform Final Fantasy XV was using. FFXII was incredible. Apart from a few small facial shading issues when the game went to HD, it played perfectly. It is what every FFXII fan would love and appreciate when seeing it revived for the current generation. Next up was a media event celebrating what Final Fantasy XV had to offer the public ran by the game’s director Hajime Tabata. We were welcomed to the briefing and told to expect a bit of a bonus during each of the day’s live streams. “All right already,” I thought to myself – still worried about whether I should be excited or disappointed. At that point I still had no idea what to expect. He began the presentation with the catchphrase: Final Fantasy XV is Leading Edge. My immediate thought was, “What the hell does that mean?” But as he spoke, it became clear. Not only is FFXV the first major attempt at bringing the series we know and love to a new medium, but the battle system has been changed to more of an action-style feel along with open-world sensibilities. It’s the latter point that caused my fears to subside – granted I know this might not be the best game in the series based on what was shown but there’s still hope. After Tabata finished I decided it was time to finally dive into the demo proper. I’ll be honest – I decided to pass on the demo they provided last year out of fear it wouldn’t live up to my expectations. I was also hesitant about the E3 demo, after they attempted to show it off during the Microsoft conference. Getting into the booth to play was easy enough. Picking up the controller, the demo brought me through some quick basics and then into the fray. My opponent was Titan – and part of build much further along than what we saw on display the day before, according to director Tabata. Not only did it run smoother but actually playing it felt a lot more intuitive than we were lead to believe. 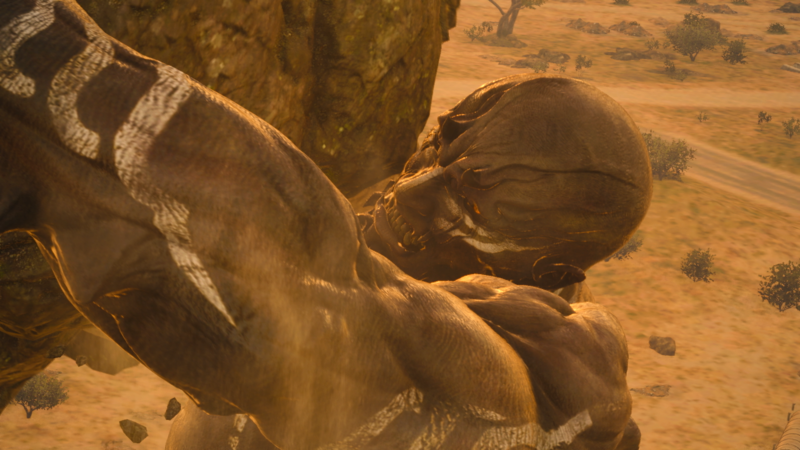 The Titan Challenge starts out somewhat subdued – lead character Noctis has to take out a few smaller enemies as both Gladiolus and he work their way up to the massive boss arena. After some story bits with Titan speaking to our irritated protagonist, he brings out his sword ready for battle. It’s up to you to stay alive until Noctis’ other friends can make their way through. As this goes on, Noctis takes on Titan’s assault – a massive arm thrown his way as I hit a command prompt to defend. 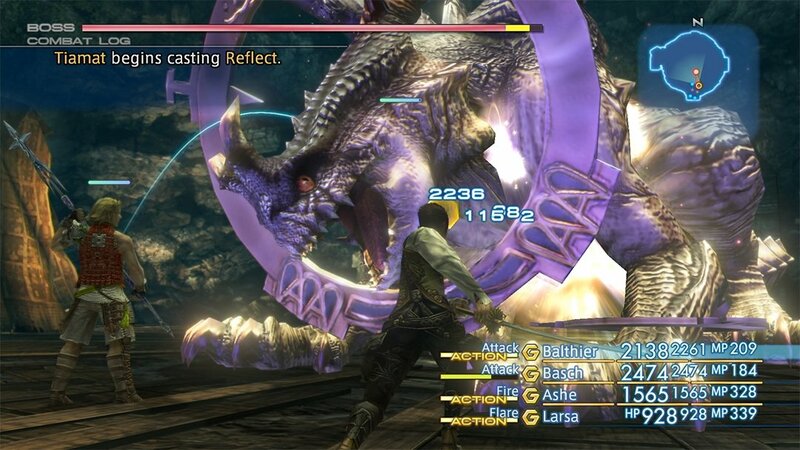 The demo made use of several Quick Time Event button prompts in order to parry and subsequently attack the beast. Going back and forth, it was all very overwhelming for our heroes. You’re forced to run further and Titan begins his counterattack as Noctis is allowed to warp around, evading damage. Overall, Final Fantasy XV’s showing at E3 left me feeling fairly positive. It became extremely clear Square Enix is trying to make the most out of a difficult situation. Eventually Ignis and Prompto join in, with Titan at the ready once more. It’s here the demo triggered me to cast Blizzara – the efforts of all my team members working together to shatter Titan’s arm and finally defeat him. The demo was interesting, to say the least. The new battle system took some time to master with Noctis warping everywhere around the map. Once I got the hang of it, however, my gripes remaining boiled down to camera and image quality. I can only hope these issues will be fixed prior to release since they ultimately detracted from an otherwise positive experience during my play. Overall, Final Fantasy XV‘s showing at E3 left me feeling fairly positive. It became extremely clear Square Enix is trying to make the most out of a difficult situation, which is not an easy task by any means. As more demonstrations become available following the batch of news we received throughout the week, I hope my fears continue to subside. As I said, I want to love this game and it’s getting there. They just have a bit to go before I’d consider it a home-run. Posted in E3 2016, Features, Final Fantasy XV, Headlines, Previews. Again, no sign of Versus XIII elements in the trailers they’ve shown…this is NOT the game I’ve been waiting for an entire decade. Insomnia was one of the big reasons why it was a game based on reality, you could actually explore a city resembling Japan’s Shinjuku district. FFS people, they’ve took that huge chunk out of the game! Completely butchered Nomura’s original vision for VS XIII. Now it’s just another crowd pandering big money title. At least we’re getting XII. I don’t mind games taking on action battle systems. But I only ask that now and then the mix in the old with the new. A few turn-based games with battle systems like Grandia 2 or Tales of the Abyss is a nice compromise of “action” and turn based. The Tales games are action in battle but traditional RPG exploration and menus in all other areas. And Lunar: Silver Star Harmony and Grandia 2 were turn-based but allowed you to pick where characters ran around the battlegrounds and also use that to attack and avoid areas where attack would land. Why not use this style of battle system with future FFs when not making flat out action rpgs? Talk about Square games or die in a ditch, robot. It’s depressing to hear you say it’s not living up to your expectations so close to release, and after so long in development. I really hope my opinion is different. I’ll be honest though, this game would have been awesome with a traditional turn based system. Then I really would have considered it a step back in the right direction. However, I did notice that Wait System kind of reminds me of FF12’s system. Obviously a little different, but still similar. That might be this games saving grace for me in terms of the battle system. I truly hope SE decides to return to Turn Based action with great graphics, and good stories. That’s what FF has always been, and if it wasn’t broken they didn’t need to fix it. This E3 i decided to go back to play the Platinum Demo. I decided to give the Iron Giant fight three chances. If i could get better with each fight with all four weapons, then i knew that i would have a great time. Thankfully it did. By the third fight i was fully using the environment weapons and warpspots for my advantage. I understand the issues of camera and frame rate but that is like the last thing i worry because of the games that i have played before (Trust me, i played Disney Infinity 2.0 Guardians of the Galaxy playset with 2 players on Wii U. That game falls into single digits for fps and its almost unplayable). Lucis is there. Heck, it’s right there on the Dawn trailer. It’s not like they completely changed everything. And back when it was still Versus XIII, I don’t think you could explore Insomnia. You start the game when Niflheim invaded Lucis, so Noct and co. are escaping Insomnia. Tabata also recently said Insomnia will not be an explorable city like Altissia, but it will be a battlefield where you will fight in Lucis, much like how it was when it’s still Versus XIII. He feels positive about the game. He didn’t say it’s not living up to his expectations. Only issue he has is with the camera and image quality. So glad they’re giving us the option to use the Duscae control scheme though which is far more intuitive than Platinum’s setup. I’m still fairly positive to be honest, they’ve shown some things that made me doubt where this game is heading, but they’ve got the elements to make this game a hit, they just need to bring it all together now. article either about his expectations, those are my words. I feel the same. It might be one of the greatest Final Fantasy games but it’s not Nomuras Versus. I can safely say this is exactly how what I thought of the demo as well. Promising stuff but let’s hope Square Enix goes for the home stretch for Final Fantasy XV. I overall figure it would be vast. The only reason this game is actionbased is because it was a spinoff at first and changing the battlesystem after such a long time would be stupid. I think SE knows fans want the ATB system, see World of Final Fantasy. And I firmly believe FF16 will be turnbased or an improved version of 12s battlesystem. Wut. Of course Insomnia is still in the game. And Lucis was never planned to be explorable outside of it being under siege. We never saw gameplay of Lucis without Noctis & friends fighting in it. I don’t see how that’s pandering to the big crowd, but okay. Btw. FF is a multimillion $ franchise since 20 years, every game was made to make money. I’m pretty sure you are right about it just being technically not a city. From everything they have shown about Kingsglaive, I am pretty sure Insomnia will be mostly reduced to rubble during the movie, making it more like Zanarkin from FF10 than a traditional city by the time we are allowed to explore it. The game looks brilliant to play in so many aspects, it’ll be interesting to see how all the pieces fit in the final game. It seems to be a very unique game. The only thing I’m worried about is the graphical quality and framerate. Understandable these issues would be present in any demo, but considering the ridiculous volume of the final game, it’s concerning if graphic quality isn’t up to par with other modern day games yet. Then again it is Square, and regardless of quality gameplay wise, their products have always been polished when it comes to graphic quality. Nomura had a vision for the game?…I always just thought he was just piecing random thoughts and even had dumb ideas to turn his game into a musical. Well according to DF and GamerSyde both demos (X1 and PS4 version ) run at a solid 30 fps , now they need to focus on the IQ (and keeping that framerate everywhere ) . This game has taken so long to release that they’re going to be fighting against unrealistic expectations as well as people’s own ideas of what this game should be. Without realizing it I myself had make assumptions about the game based on very limited information given back in the VS XIII days. I don’t think they’ve changed as much as some say, because I don’t think there was much of a game to begin with. I so badly wanted to know more about this game that I had made up my own version of the story, how it should play, etc. But its not my story nor am I the director. Tabata doesn’t seem to have blatenly wanted to change anything but had to for the good of the game. He even apologized for the Luna/Stella thing. Once I came to terms with my absurd expectations. I was alot more positive about the game. I totally agree that the controls may need some polishing but I think everything else will be excellent. I think they’re going in the right direction. In summary, give this game a chance and realize that your expectations may not be reachable/and or ridiculous. From what we saw in the trailer for E3 2016, you will likely only be able to go into Lucis for the FINAL BATTLE penultimate dungeon, along with being there in those snazzy trench coats. How is it more intuitive? The newest scheme you literally hold down a button to attack, and if you wanna switch weapons you can do it on the fly? Then to defend, you hold down a button. and to warp you use Y (Or triangle I guess). I’ve probably put 20 or so hours into the platinum demo. I still don’t know what camera issues people keep talking about. It’s literally in the name of the game. The first one was their Final Fantasy because Square was going out of business. Umm, FF is 30 years old. The money thing started with 7.
i disagree.. because how would you even fill a city that large of the size of a GTA Game with quest content? Quests like ,,Rob a bank” or anything doesnt work out for a Final Fantasy.. just saying..
yup i think so, too. Lets see how much we see of Insomnia. But i think a huge Openworld modern City like Insomnia would be a waste of ressources.. it would be as huge as a full GTA game.. and then how would you fill such a city with good RPG quest content? Rescue the lady from thieves? Wouldnt work out for FF quiet well..
Im asking myself if they cut this out of the game. I agree 100%. They said before this isn’t Skyrim. (Thank God) Every little street doesn’t need to be explorable. It would make the game bloated and unfocused. This. The time this game took to come out + Nomuras teases and tidbits made people think up their own story and set their expectations way too high. People think it will be next coming but in reality it just will be a new FF. Many people have problem with Circle being the attack button is what I gathered. Btw. with “Duscae” control scheme he just meant the button-layout not the weapon switching and stuff. Well the Titan fight clearly has them, the Iron Giant was fine because you had a really open space and just 1 enemy that wasn`t that big. I trust them to get it right, but especially the Titan demo made it obvious that the camera still needs some work. Yup, they confirmed that. They basically took the start of the game from Nomuras idea and worked it over into the last area you will probably enter (unless some typical other realm or something comes up, FF likes to do that). I’m pretty sure they overhauled a lot of ff15’s development including the battle system after they decided to shift gears from versus to 15. They had plenty of time to reinvent the battle system. I doubt the original versus13 battle system was hardly developed at all anyway. If you read these interviews about how they wanted to make this a western/Jrpg mix it really feels like they kept that battle system to bring in the “Western” fans who favor action based games. That being said, no one truly knows all that behind the scenes stuff, but hopefully it feels like Kingdom Hearts and ff12 mixed. I would be happy with that. Well they made a promise back in 2006 that this game is going to be actionbased, so SE probably thought it would be best to just do the game they promised back then. And honestly this franchise needs new fans. I will deal with a action-based combatsystem inbetween turnbased ones if that means the franchise I love growths in strength. Remember though, they had the exact same mind set with ff13 and their “Western” approach. It didn’t pan over to well. Also, if the franchise leans too heavily on action based content which grows in popularity more so in the west. I can bet you won’t see a turn based FF game for a long time. Follow the money is what their thinking. Plus, I remember reading an article where someone at SE said they thought turnbased was too boring for gamers now a days. Might be an okay thing for side/spin off titles, but not main stream numbered additions. Don’t ask where I saw that article, but it’s out there. Well some higher-ups at Square also said that just because XV is actionbased doesn`t mean the franchise will go in that direction for every entry. I can’t find any footage of the Titan Demo from the show floor, but what they showed on stage was an old build, that’s probs why. How is the button layout different? Attack is Square is probably the main change people want. Sorry, I meant. What are the button differences between the two layouts?